Since we're doing threads on many other weapon and armour forms, how about one for saxes? Let's see those saxes (no reed instruments, please)! 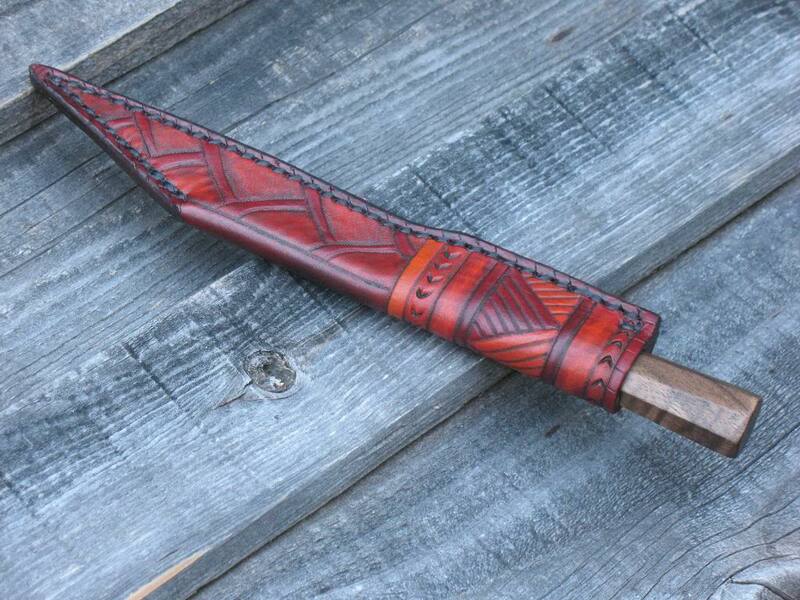 My broken back seax by Michael Pikula. 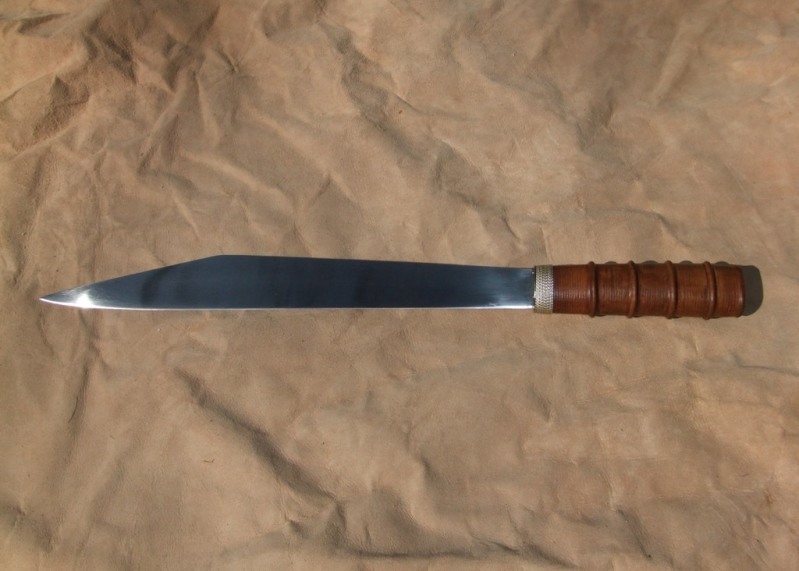 The seax is 19.25 inches overall with a 14" blade and a POB 10.25” from the tip. My camera is broken or I would flood this post with pics! I'm posting a few saved shots that the maker's of these seaxes sent me. 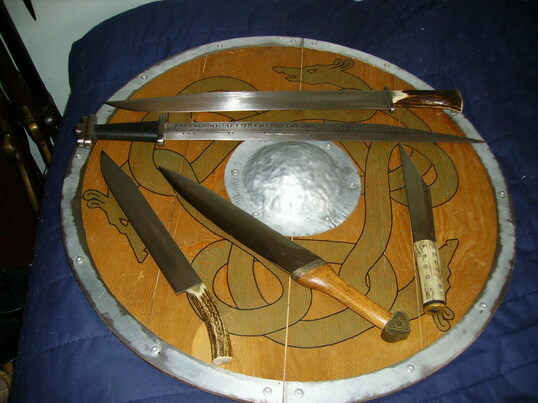 I'll take some pics of my other seaxes and some groups shots when I get a new camera. 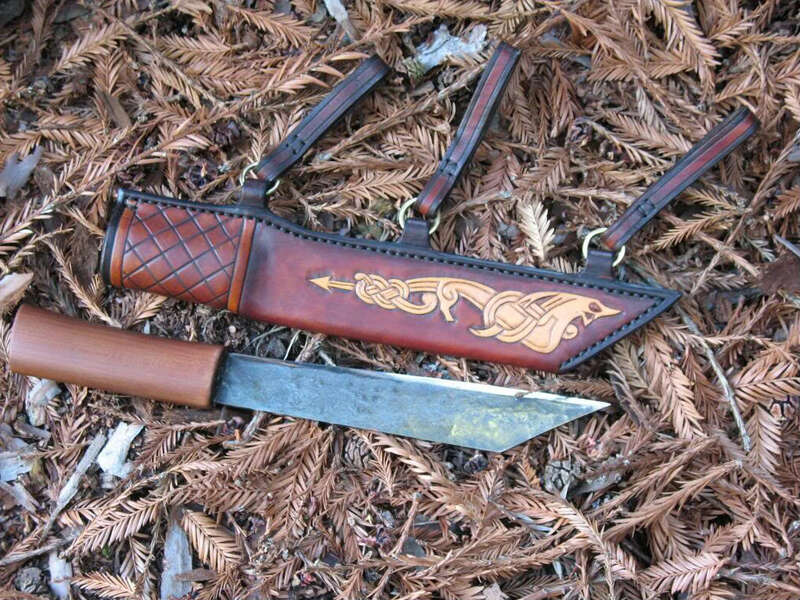 The pattern welded seax has bronze inlay and was made by Michael Pikula. The black handled one is by Eric McHugh. It has an ebony wood grip with antique iron fittings. The carved grip one is by Jake Powning. 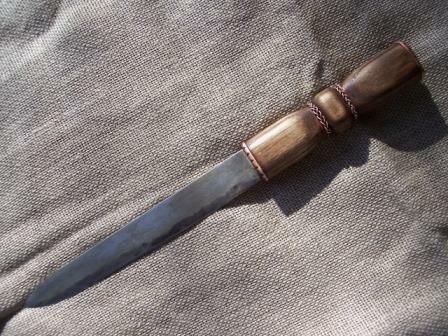 Here is a Seax made by Petr Melc. A beautiful rough forged piece. Leather sheath made by me. this blade was a failed attempt, but lessons learned, and I finished it anyway; (I snapped the steel edge after heat treat.) Still needs a sheath. 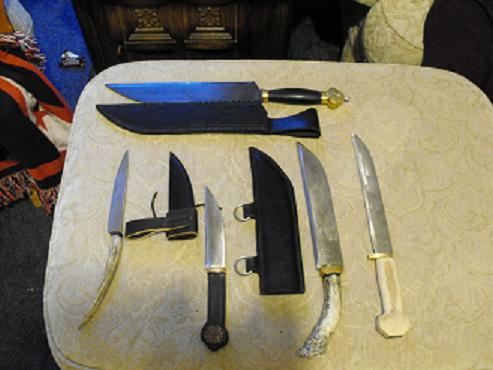 Second, a better shot of the Lutel "short" saex and the Paul Binns broken back. 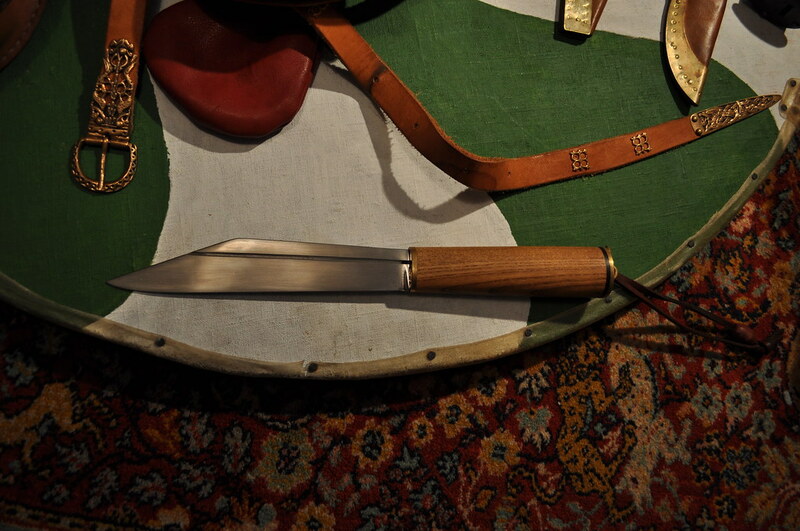 Here is my broken-back seax from Tod and Owen Bush. 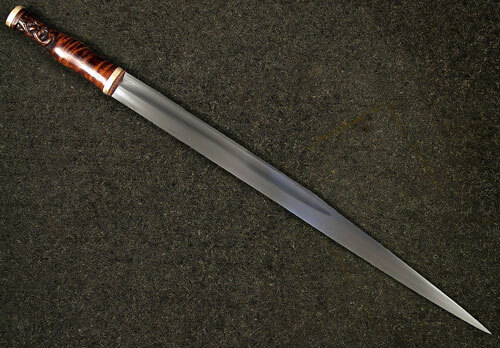 This is the same inlaid seax currently reviewed on the main page- only I had the handle lengthened a bit. 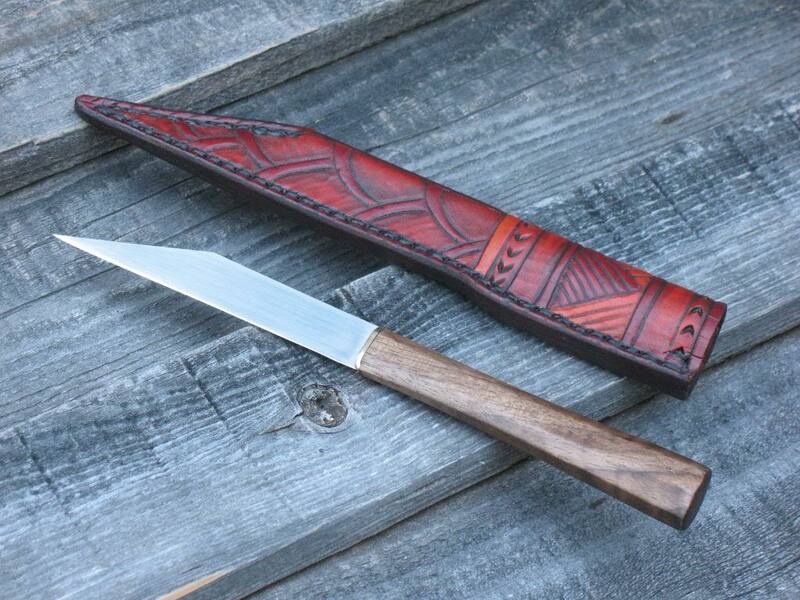 Here is a beautiful little seax made by Michael Pikula. Just recently purchased from his post in the Makers/manufacturers forum. An amazing little knife. That looks great! Let me compliment you on your scabbard-making ability. 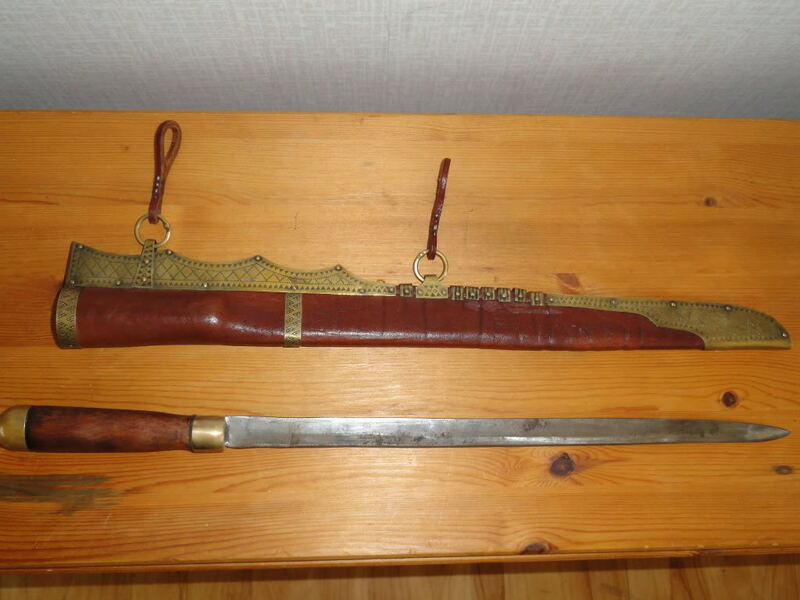 I second that about the scabbard: Very attractive and matches the seax well. Makes me even more looking forward to getting my knife from the same sale i.e. #6 in the group. 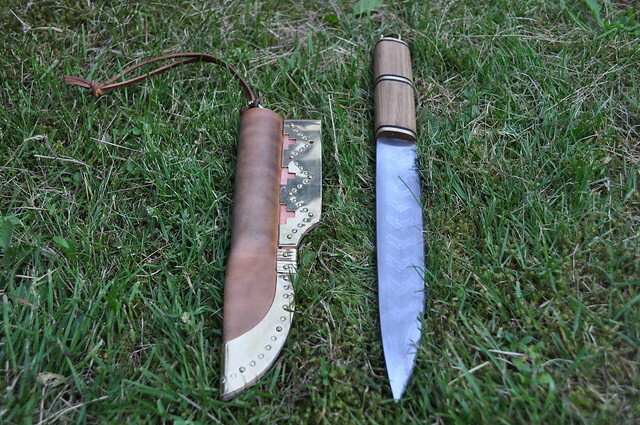 I really want to make this a using knife and use it daily as a general purpose kitchen knife although I think it would be very much usable as a hunting/survival knife or as a general purpose knife as it was in period: The knife you always had with you for daily cutting chores from eating to anything else that needed cutting to last ditch fighting knife. We mostly just " baby " our collectables and barely make use of them but in some cases the best way to honor the maker is to make use of their knife without any though of re-sale and keeping the blade pristine. One also respects a blade by keeping it sharp and rust free but accept any staining or wear that normal use would bring. One obviously avoids any abuse of the blade if one cares for it. 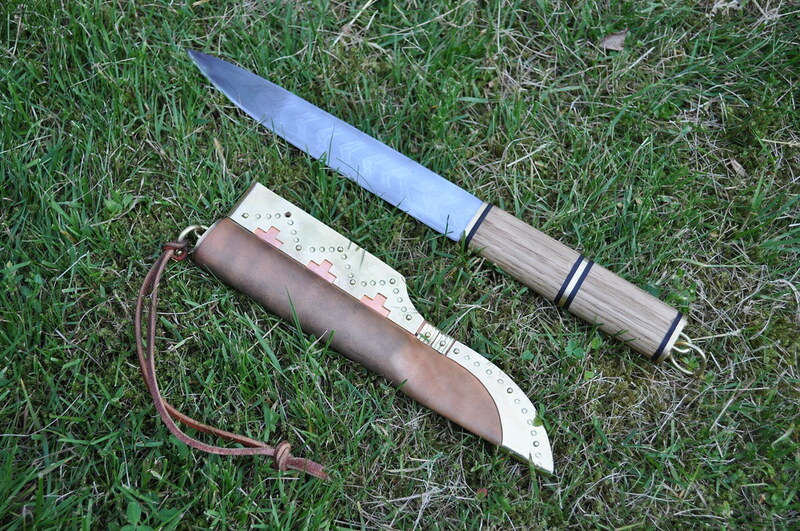 Blade was made by Hector Cole (i believe based on the Northampton seax), handle (antler) by Andrew Nicholson (Dumfries & Galloway county archaeologist and all round good guy). It's been in this state for a few years (I picked up the blade for a song and traded some silverwork with Andy for the handle carving) and does need a good polish. 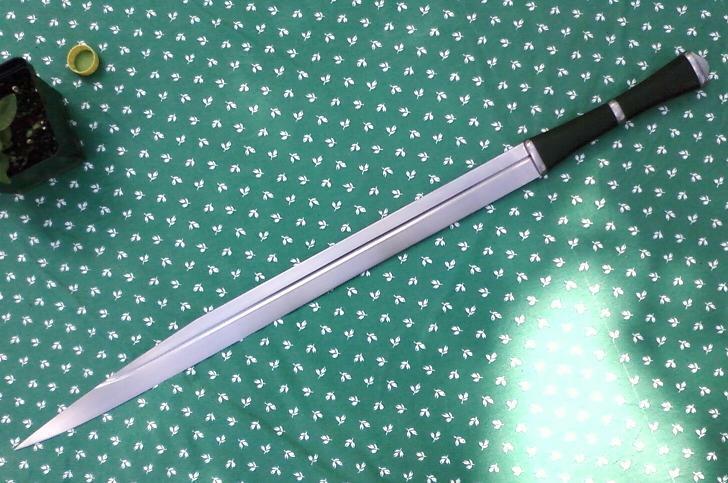 I keep meaning to fabricate an end-cap in silver (to hide where the tang passes through the handle and had to be peened over) and obviously make a scabbard for it but it's honestly become one of those projects that i keep aspiring to get good enough to attempt. One thing i have been toying with is some form of inline paint to pick out the carving (possibly a red or black), but i need ot do some honest graft first. 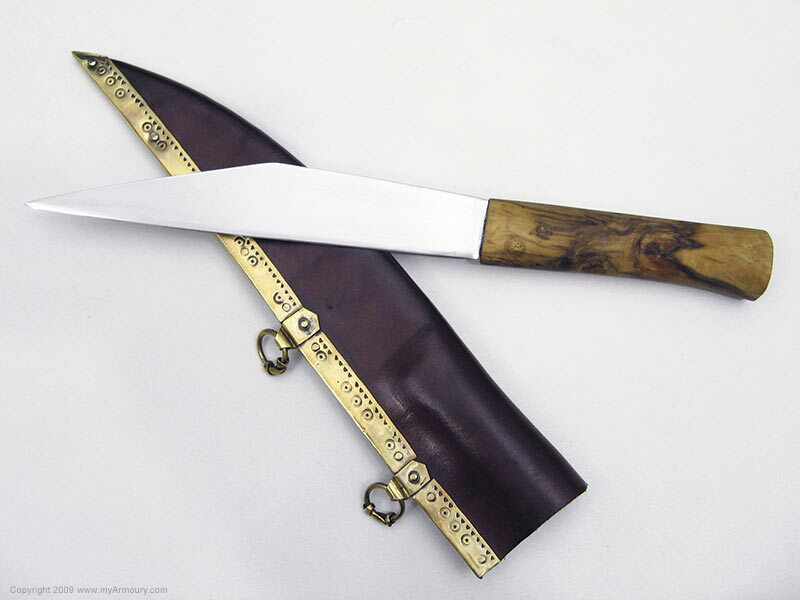 Patternwelded with oak, brass and leather in the grip. 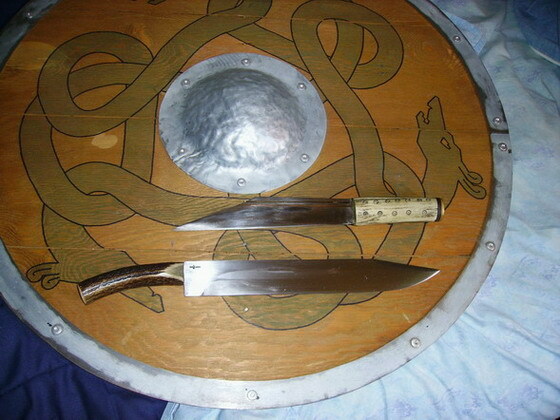 Both knives made by me. Grip and sheath by me and my brother. I didn´t want this thread to be forgotten, so I add another sax of mine. I have not made this one myself. Bought it some years ago. But had it re-gripped and re-sheated by an artist named Edvin in Sweden. An Anglosaxon styled broken back sax. Hi all, this is my frist post in this great forum, my name is Ismael and I'm from México, I ask an apology for my bad english. I like the blacksmithing and medieval weapons, mostly i love the forge. This is my langsax, made by me in 1070 forged steel, tempered, handle of copper, cow horn and bone, wood, and iron "pommel", riveted full tang. 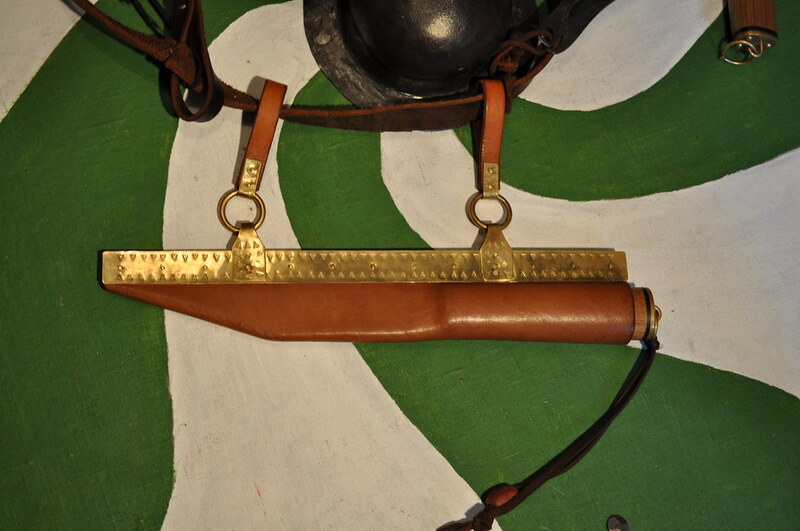 Leather scabbard with bronze ornaments. Hi Ismael, How long is your blade? Sorry, I forgot to put the measures. Has 52cm of blade, and 67cm in total. 3cm wide and 4mm thick, the edge is 1 mm and rounded tip. Tim, I love all of the seaxes that you posted; they're excellent! In particular, the one by Eric McHugh is exceptional! If you cant make the blade you carry-Support the custom makers ! !